Pilatus PC-12NG flying into a sunset. Image: © Paul Sadler | Pilatus Aircraft Ltd.
Congratulations! You’re about to transition into a single-engine turboprop (SETP). You’ll need to use most of the skills you’ve developed as a pilot of a piston-engine aeroplane. But there are significant differences in the way you’ll fly a turboprop—and only some of them are related to the engine itself. 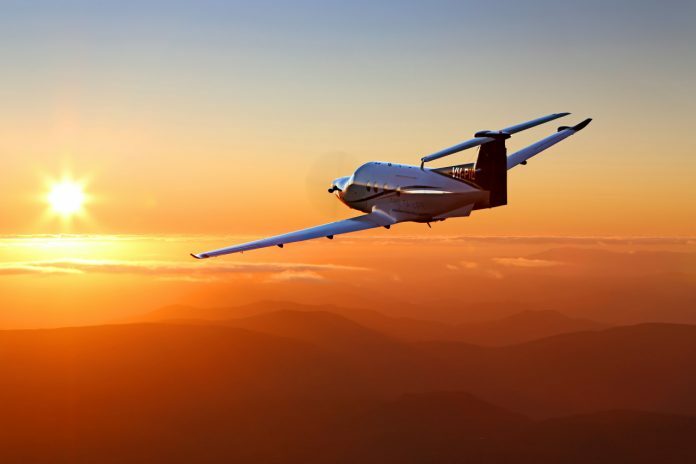 Let’s take a broad overview of what you’ll need to study and master in order to fly a SETP aircraft. The first difference is the engine. It’s usually beneficial to compare what you’re learning to what you already know. So let’s compare and (primarily) contrast piston-engine and turboprop engines. A turbopropeller engine (turboprop) is similar to the piston engines with which you’re likely familiar, in that both types are internal combustion engines. Where the process of combustion in a piston engine occurs in individual, distinct ignition events, a turbine engine is ingesting and compressing air, accepting fuel, and igniting that mixture continually—a piston engine might be considered a ‘rapid explosion’ device, while a turbine is a ‘continually exploding’ power source. In a piston engine, exhaust is a waste product that is vented overboard (although some of that waste power is captured in supercharged or turbocharged piston engines). In a turboprop, by contrast, exhaust is the primary product. It spins turbines that in turn drive gears spinning the propeller (to generate thrust) and the engine’s compressors (for combustion). A piston engine’s ignition system operates the entire time the engine is running, providing spark to the cylinders. Once a turbine engine starts, the igniters are turned off; ignition is constant as air and fuel are continually fed to the engine and the fire continually burns. Piston engine power is measured in horsepower (HP) and is determined by manifold pressure, propeller speed and fuel flow. The power of a turboprop is measured in shaft horsepower (SHP). Shaft horsepower is a function of propeller RPM and the force (torque) applied to the propeller shaft. Some jet thrust is also produced by exhaust leaving the turboprop engine. This is added to the shaft horsepower to determine the equivalent shaft horsepower (ESHP). Jet thrust usually accounts for less than 10% of a turboprop’s total power output. A turbine engine compresses air, but the amount of compression is usually fixed. Therefore, as the aeroplane goes up in altitude and the ambient air pressure decreases, the turboprop’s power output decreases as well—turbines are normally aspirated engines. Since turboprops generally have much more power than piston engines, however, they still tend to outperform turbocharged piston aeroplanes at most altitudes. It’s important for you to know, however, that turboprop aeroplane performance decreases with increases in density altitude. Piston engines are controlled by throttles, propeller RPM, and fuel mixture controls. Turboprops come in two basic designs: fixed shaft and free turbine. 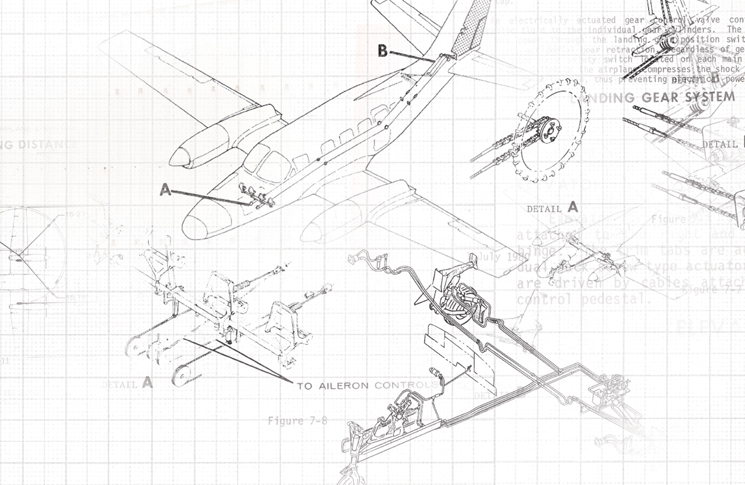 Fixed shaft turboprops, in which the propeller is directly connected to the engine and rotates any time the engine is running, use a power lever (sometimes called thrust lever) and a condition lever. The power lever adjusts torque and propeller speed. The condition lever controls engine speed and fuel flow. Free turbine (or split shaft) turboprops have a propeller coupling that permits the turbine to run without spinning the propeller. Free turbine engines have three engine controls: the power lever, setting pressure or torque output; a propeller RPM control, adjusting propeller speed (generally much slower than piston propeller speeds, usually 1500 to 1900 RPM); and a condition lever that is basically on ON/OFF control for the fuel. Leaning is not required in any turboprop engine, but is controlled automatically when the pilot sets the power lever. Turboprops have strict operating limits of torque, internal temperature and rotational speed. Unlike piston aeroplanes, in which ‘full throttle’ is almost universally correct for take-off, in turboprops it is almost never appropriate to push the power lever to the forward stop. Exceeding torque engine speed or temperature limits for even a few seconds can be catastrophic to the engine. During engine start you must watch for a ‘hot start’ condition, that is, exceeding temperature limits, and immediately shut down the engine if it overtemps (the term is the same, but this is completely unrelated to ‘hot starts’ in fuel injected, piston engines). During the take-off roll and climb, you must carefully watch the torque gauges, engine speed and temperature gauges, and advance the power lever only until reaching the maximum permissible amount on any one indicator. As the aeroplane climbs and power output decreases, you may be able to advance the power lever to maintain or even increase power in climb, as long as the engine stays within all three of its limits. Almost all turboprops have a reversible-pitch propeller. This permits you to direct thrust forward, instead of rearward, to dramatically shorten landing distances. You’ll reverse the propeller by pulling the power lever all the way aft and over a stop. There are limits on reverse thrust, so you’ll have to use this capability carefully. Like piston twin aeroplanes, SETP propellers are featherable. This reduces drag in the event of an engine failure, in the case of SETPs to increase glide distance. As we’ll see near the end of this article, despite their famed engine reliability, you still need to be ready for engine failures in turboprops. Pliatus PC-12 aircraft landing. Image: © Pilatus Aircraft Ltd. Most piston aircraft systems are incredibly simple by comparison to SETPs. As one measure of the quantum leap in complexity, count the circuit breakers in even a pressurised piston twin, and compare that to the number in a SETP. Ice protection, electrical inverters, and in many cases pressurisation—you’ll need to spend time ‘in the book’ learning how each system operates in normal, abnormal and emergency situations. In a turboprop you are still a pilot, but you are just as much a systems manager. To manage the systems properly you’ll need to be strict about checklist use … not because you can’t learn to fly a SETP without them, but because they are so complex it is more likely you’ll miss something in high workload environments. Most, but not all, SETPs are pressurised. All turboprops are more efficient above 10,000 feet. When transitioning, then, you’ll need to become comfortable and capable in a medium- to high-altitude environment. Studies on hypoxia, supplemental oxygen use, high-altitude navigation and meteorology are just as important in your studies as the aeroplane’s flight manual. The flight levels you’re operating in are in the same airspace as airline and military pilots—and you are expected to fly with the same level of professionalism as they exhibit. High altitude or low, it’s vital you fly the aeroplane precisely. 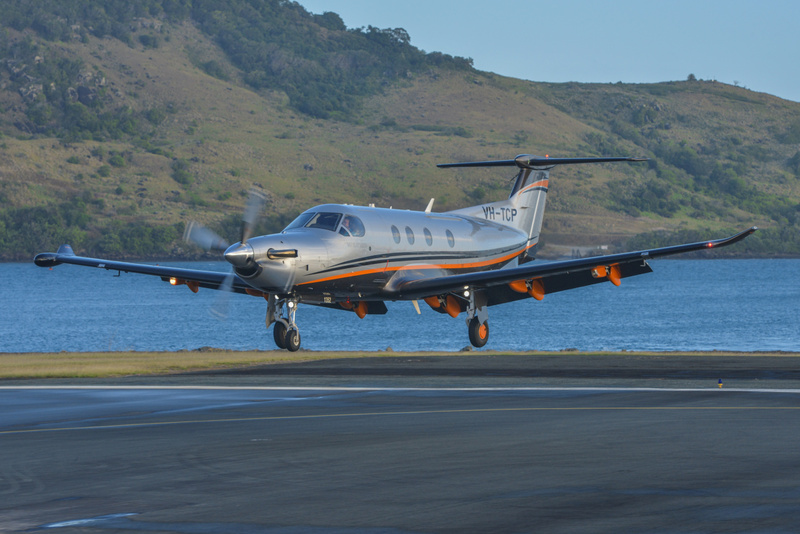 At first you might think the added power of a turboprop means you can get away with a little sloppiness, especially during take-off and landing. The reality is that even flown precisely, turboprops typically use more runway than piston aeroplanes. You’ll often have less of a margin for imprecision—you need to be right on speed and glidepath to land safely, and precisely on speed and attitude for take-off. There are several characteristics of most SETPs that cause them to fly differently than the piston aeroplanes with which you’re more familiar. Let’s look at the variables to get at least a basic idea of the differences. 1. Wing loading. Wing loading is the weight carried by its wing area. The higher the wing loading the higher the stall speed. Take-off and landing speeds increase, and climb speeds decrease, as a result. Higher wing loading increases stability and reduces the impact of turbulence, but it often also results in higher stick forces—the aeroplane ‘feels’ heavy, and it takes more effort to manoeuver. 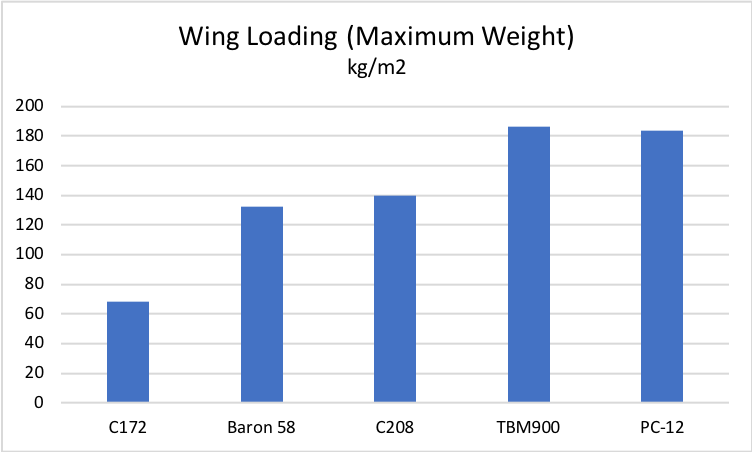 A comparison of the wing loading of familiar piston-powered aeroplanes, the Cessna 172 and Beech Baron 58, and popular SETPs, the Cessna 208 Caravan, TBM 900 and Pilatus PC-12, tells us that performance and handling will be noticeably different when you transition to turboprop aeroplanes. 2. Power loading. Power loading is the aeroplane’s thrust divided by its weight. The higher the power-to-weight ratio, the faster the aeroplane will accelerate, climb and cruise. Comparing power loading gives you an idea of the differences in performance. 3. Weight and centre of gravity range. Aeroplane stability and performance are determined in part by the location of its centre of gravity (CG). An aeroplane with a wide range of allowable CGs will have changes in performance and handling depending on how it is loaded. If that allowable range is great, even within limits, there will be notable differences in the way the aeroplane flies. Familiar piston aeroplanes have fairly narrow CG ranges. The Cessna 172, for example, has a 16 centimetre range in allowable CGs, from the forward to the aft limit. The Beechcraft Baron 58 has a wider CG range, about 19.6 centimetres. 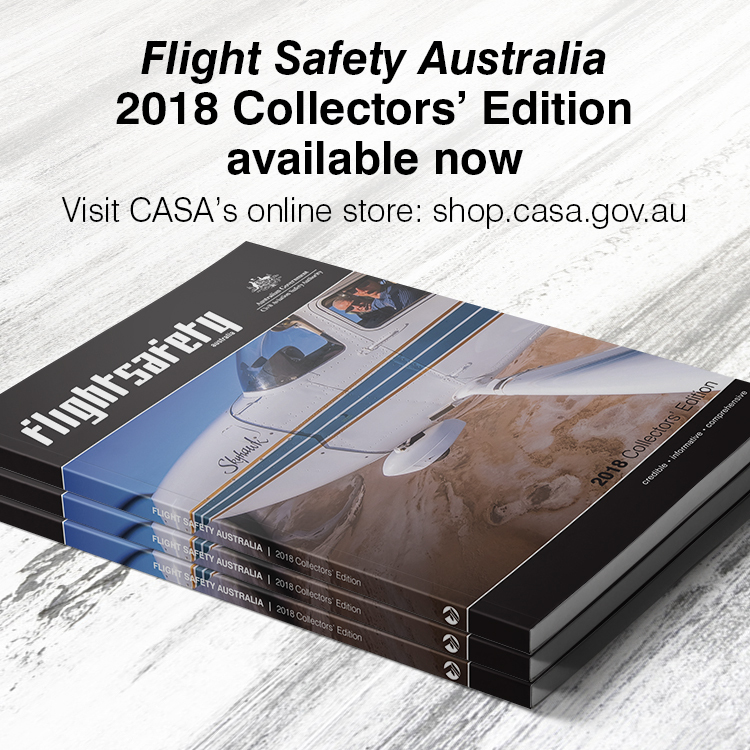 The CG range of the Cessna 208 Caravan, a true freight hauler, is 55.7 centimetres. 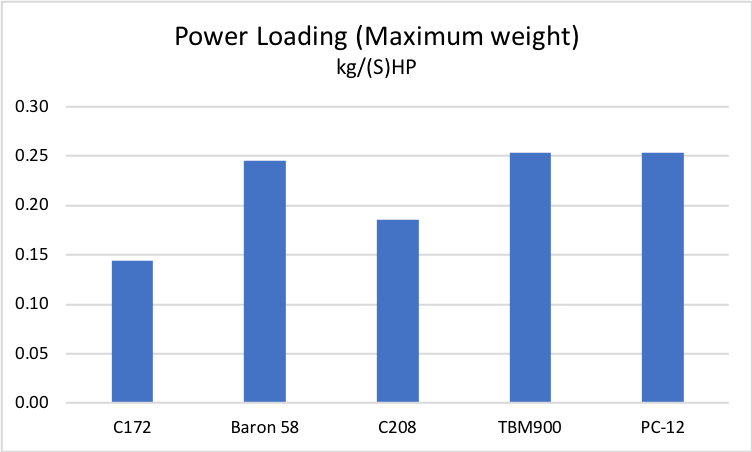 The TBM900’s allowable CG range varies by 24 centimetres. Pilatus publishes the CG range of the PC-12 in terms of percent of mean aerodynamic chord (MAC)—the average distance from the leading edge to the trailing edge of the wing. The PC-12’s CG range is from 27% to 44% of the MAC. Even without converting this to distance in centimetres, you can visualise a wide variety of performance and handling with variations within the allowable centre of gravity envelope. You’ll be required to complete stringent training before you’ll captain a SETP. The syllabus will undoubtedly focus on all the things we’ve covered above—you’ll be trained to a level of mastery of all the differences in systems, operations, control and handling. With that mastery you should be able to avoid accidents, right? 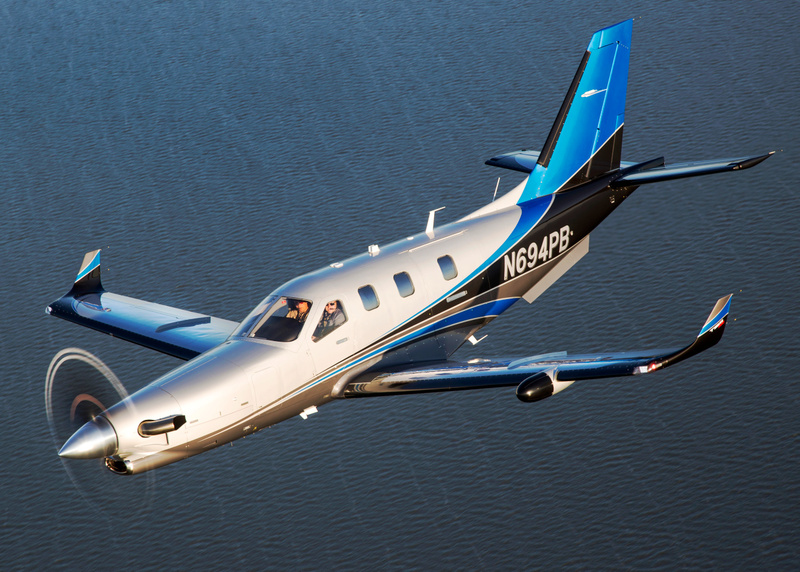 Daher-Socata TBM 900 aircraft. Image: CC BY-SA 30 | Michael Mainiero. You can see that the things that lead to crashes in SETPs are not much different from the factors involved in piston aeroplane crashes. It’s been said that everything about flying light aeroplanes applies to heavier ones, but not everything about heavy aeroplanes applies to lighter ones. Everything you do (and are supposed to do) in piston aeroplanes—airspeed control, attitude control, rudder coordination, systems knowledge, checklist use—is even more important when you fly a SETP. Great reading on the differences between piston engine and turboprop aircraft but with their inherant similarities given they are both internal combustion engines which also have some rather different operational characteristics! I found some of the article misleading with ref to the exhaust of a piston engine being wasted compared to a turbine, they are both ‘wasted AFTER the charge has done it’s job in both instances!